Make an impact in bold pink and blue! This stunning kaleidoscope-inspired design is set to make a statement! Featuring a classic round neck kaftan silhouette and crystal embellishment, this style is ideal to hire for your next date night or party! Keep it chic with a sleek ponytail and simple heels! Complete the look by renting with a sparkly jewelled bracelet! Get inspired with our Birthday Style Inspo blog post! 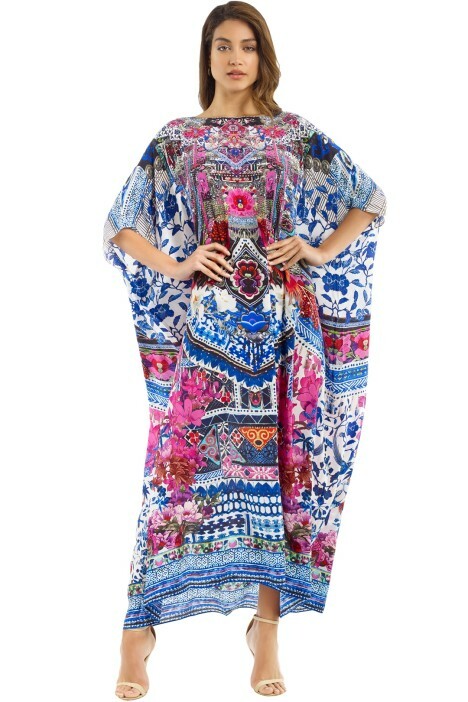 Bohemian Paradise Kaftan - Blue is rated 5.0 out of 5 by 1. Rated 5 out of 5 by Lisa from Baby shower I rented this Camilla for a family baby shower. I recently had a baby myself so I found this dress both comfortable and flattering. It was also nice and breezy on a hot day.